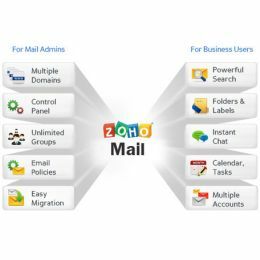 Zoho Mail is a powerful email hosting application designed for business users and improves productivity and communication, is easy to use and, at the same time, includes a wealth of advanced features. Zoho Mail has a sublime user interface and includes features such as multiple email accounts, powerful search and filters functions, calendaring, notes, tasks and contacts. And with Zoho Mail you can also improve your communications by exchanging messages in real time with the chat feature, organize your email better with multi level folders and filters, tags and flags, and enhance the management of your email and time with advanced searches, including scanning attachments, sharing calendars, and create and edit tasks. Zoho Mail subscriptions include free and paid editions, with the Standard paid version being excellent value at starting at approximately 20 GBP per year per user which includes 15Gb storage for each user. For more details on Zoho Mail hosted business email solution, as well as our Zoho consulting and setup services please email us at info at mangoho dot com or contact us here and we will respond within one business day.